I'm sceptical when it comes to happiness self-help books because my first thought is, how does the author know what truly makes me happy? But I am drawn to happiness books. Just the word happiness makes me smile. 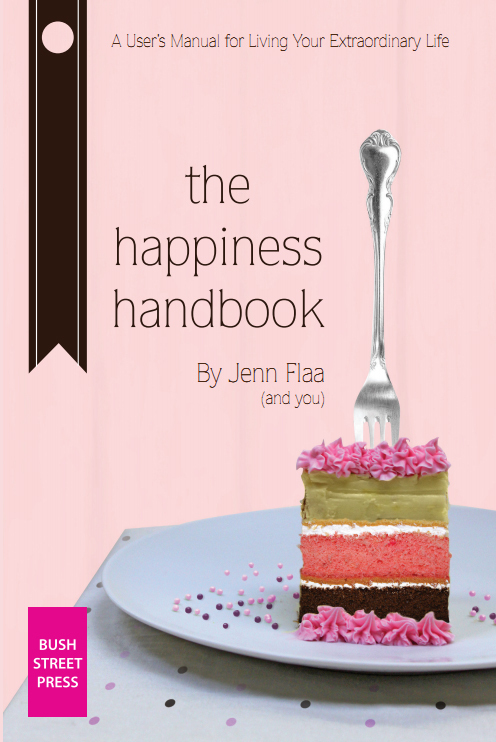 Which is why I was interested in The Happiness Handbook by Jenn Flaa. And after reading just a few pages, I was smiling and thinking that this was going to be, not only a fun interactive book, but one that would draw insight into me, moi, yours truly...sigh, yes, complicated old me. I loved the simplicity of this book, although it wasn't simplistic. This easy to read, practical book is really a handy workbook. It was just what I needed to really be honest with myself and put down on paper things about myself that I could then share with my husband and he in turn with me. The real reason I loved this book? It is foremost a communication book. It is a tool that adults of any age and gender can use to communicate who they are and what makes them happy. In my line of work, communication is key. In marriage communication is key. In the family dynamic communication is key. Which is why I think this book is great. Flaa doesn't pretend to be a specialist in the field of happiness. She's a girlfriend sharing what she's learned: mainly, we're all unique and what makes one person happy may not make another feel the same way, so one needs to take the time to clarify what that is. Flaa tells us that she's been through very rough times without disclosing her past. Instead, she discusses ways that someone who is currently unhappy (for whatever reason) can move beyond that. Her troubleshooting section at the back of the book has some good suggestions. I talked about this book with my hubby and we decided to fill out the worksheets and share our statements, ideas and thoughts with one another. Already, I can see that it has made a difference. I only wish the color of the book's cover would have been different (less chick-lit style) and more universal so that some men wouldn't disregard it but might actually think of picking it up. I recommend this book for all couples, but I think it useful for single persons too because it will clarify what one needs in a partner or any relationship for that matter. Truly, it's a little gem of a book. Simple and effective. Watch for an interview with the author and a giveaway of a copy of this book on May 7th! Disclosure: Thanks to the author and Premier Virtual Book Tour for sending me this book for review. I was not compensated in any other way, nor told how to rate or review this product.